Thanks for the intro! I think the problem was I showed people things too early. Really, it was about me figuring out how to write, like a child writing their first story. What I needed was pom poms and cheering rather than detailed critique. But neither I nor they knew it at the time. In terms of finding my way back, the short answer is my wife, Emma. A few years ago she suggested that I was a frustrated writer and she was right! I started writing the next day and never really looked back. One of the main characters in your book is a baby. Did her portrayal owe much to your own recent experiences of fatherhood? I’m sure it does. One of things about having a baby is that I was suddenly plunged into the world of playgroups and park walks, so I got to see a lot of different babies in addition to my own. One thing that struck me is how different even very young babies are in temperament and character, and the impact they had on the adults around them. There is also the goat. What goat-related experiences do you have? *Whispers* Very, very little, don’t tell anyone. Though I’ve now spent a lot of time reading about goats and watching videos of them on youtube. I’m sorry to say I’ve not yet played Goat Simulator. Ever considered using the phrase ‘fragrant vagrant’? How did you resist? How does it feel to be married to a successful author? Wonderful! It’s been especially great being the one doing this second as I get to benefit from Emma’s experience. This has saved me trouble on a number of occasions! We’re very involved with each other’s work and I know that I’m incredibly lucky to have another author to consult and check things with whenever I want. It’s why I run workshops at conventions to help authors stuck with their manuscripts – to spread the love a little! Please tell us about the Tea and Jeopardy podcast. It’s an interview podcast crossed with a bit of audio drama. In each episode the guest comes to the Tea Lair to meet Emma for tea and cake. Tea Lair’s have included gingerbread houses, giant robots, volcanoes and chocolate factories. At the end of the episode the guest has to escape some sort of peril, often instigated by the butler, Latimer. It also features singing chickens! We’ve just hit our 50th episode too. Previous guests include: Pat Rothfuss, Nora Jemisin, Peter V Brett, Myke Cole, Charlie Jane Anders, and Joe Abercrombie. 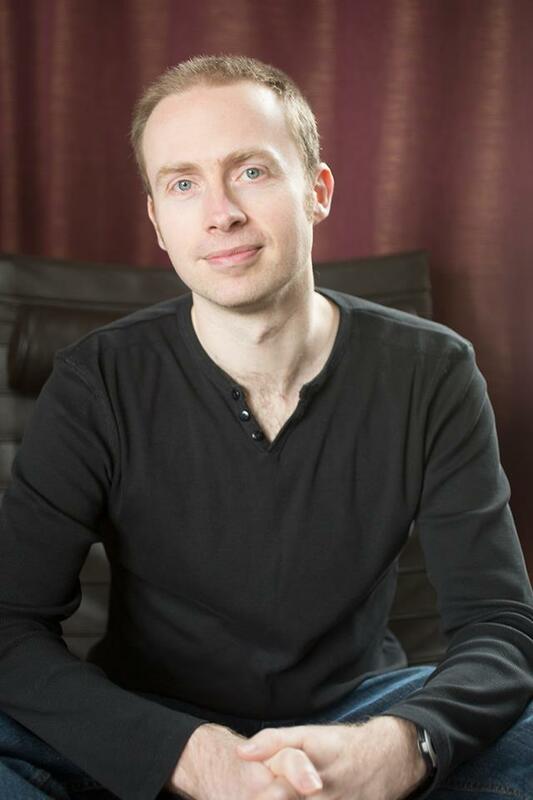 Could you please tell us a bit about Albion Online and how you have been involved in its development? Sure! 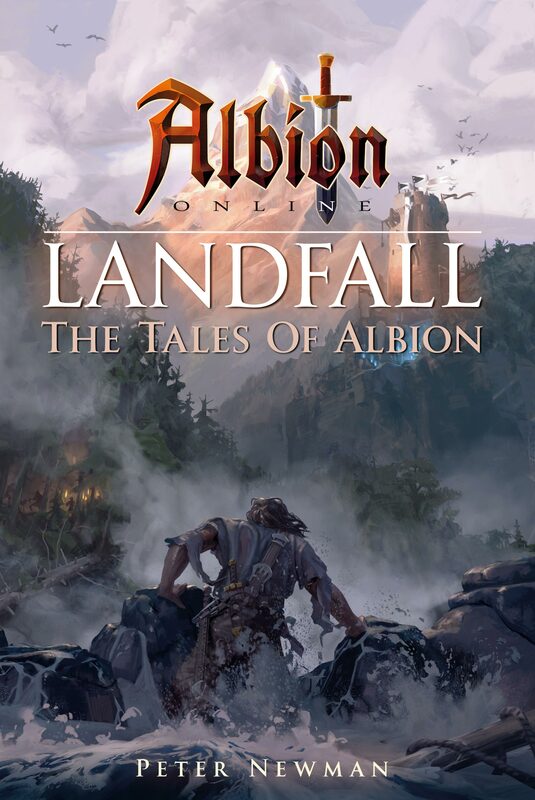 It’s a fantasy MMO that’s currently in Beta, where players go to the land of Albion to explore, fight various monsters, claim territory, build things, and battle each other for control of the world. I was brought in to do two things. One, to write the game’s history and give depth to each of the factions. And two, to write a novel set in their game world, which I have. It’s called Landfall and is out now! Hmm. Probably getting to play the game and legitimately call it research. Although, getting illustrations in the book was also really cool. What did you find especially challenging? 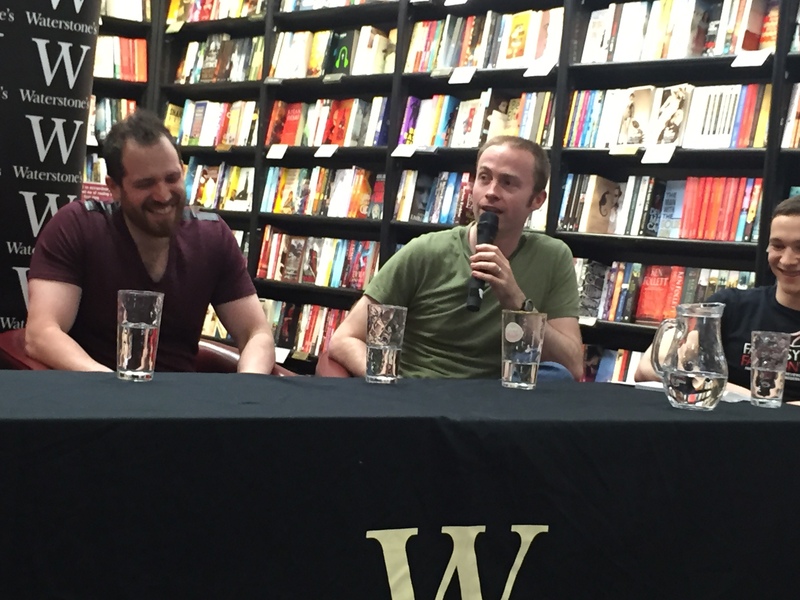 I was very keen that the world of the book and the world of the game had the same atmosphere and that players or readers would feel at home if they transferred from one to the other. At the same time I wanted the book to work as a distinct entity, without people needing to know anything about the game to enjoy it. Other than that it was mainly just a lot of fun to do! 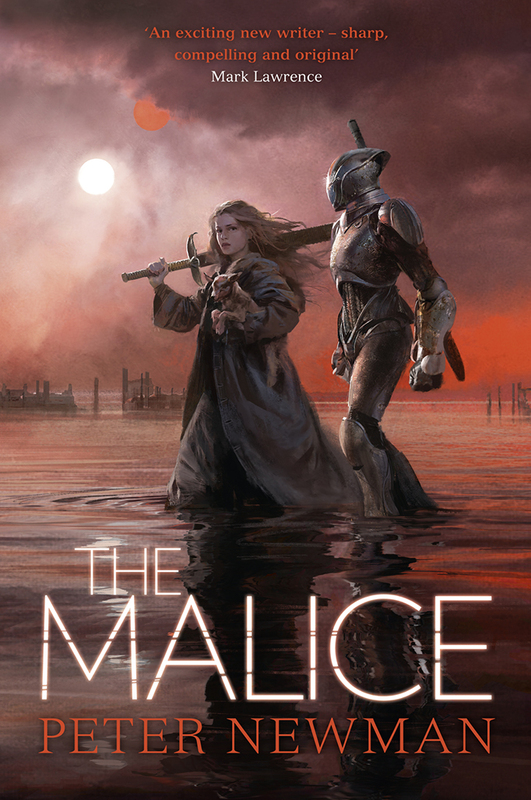 The Malice is out in the UK on the 19th May (US folk will have to wait till next year I’m afraid…) I love the cover too! I was so thrilled with what Jaime Jones did for The Vagrant but I might love this one even more. The second book is set some years after the first. We’ll get to see how the next generation of humans, demons and goats are shaping up, and explore the consequences that have resulted from some of the choices in book 1. There is also a secondary story set over a thousand years ago where we get a peek at the world before the demons arrived and learn how the Empire of the Winged Eye came to be. The Seven (book 3 of The Vagrant trilogy). I’m nearly finished too! Do you have time to read much? What were some of your favourite titles you read in the last few years? Not as much as I’d like but I get through quite a bit. I finished reading Robin Hobb’s Farseer Trilogy last year, probably one of the best set of books I’ve ever read. I loved Joe Abercrombie’s First Law books too. More recently I really enjoyed Traitor’s Blade by Sebastien de Castell, the Death House by Sarah Pinborough and the Copper Cat trilogy by Jen Williams. I’m also working my way through the ten book epic Shadows of the Apt series by Adrian Tchaikovsky (onto book 8 next!). They’re all great in different ways. One of the (best) problems with being an author is that you’re forever meeting lovely people who have written cool books and it’s impossible to read them all. That said, I’m swearing a solemn oath right here, right now, that I will have read something by John Gwynne by the end of the year! As a judge of the flash-fiction writing contest what qualities are you looking for in the entries? I started out writing flash fiction so it will always have a special place in my heart. I’m pretty open to all kinds of entries, whether they are complete stories in miniature or single moments, so long as they’re well written. Great interview, reblogged on my blog TheTattooedBookGeek. Great interview – and stunning covers! I started writing again almost 20 years later. She recently called me up to say how much she loves my work, and how great it was that I’d obviously found my calling. She had no memory of her putting me down – at all!